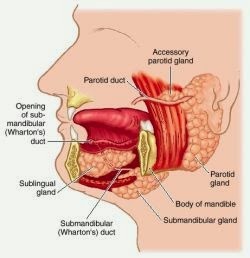 Parotid glands is the largest part of the salivary glands, it has a wedge shaped deep section and flat shape in superficial that lies anterior (forward) to the external of the ear and expanding inferiorly to the ramus of mandible and posteriorly to mastoid process. The deep or retromandibular (back of madible), portion expands medially toward the pharynx. From the interior oral cavity and opposite to 2nd upper molar the parotid duct is running anteriorly and medially.